Several friends (including John Romkey, the gentle genius who truly gave me <wendycarlos.com> -- thanks, John!) and I observed right at the airport, which was several miles south of the capital of Oranjestad, and so had a longer duration of totality. Also, we were pressed for time, and had to get right back. That meant getting the 4 PM plane, which was cutting things pretty close...! The day before, when we arrived, I had noticed a great observing spot for this windy, dusty island: a bus waiting station with open walls, a hard floor, ceiling for wind and sun protection, and big extended windbreaker wall in front of that. It was right at the airport. Worked out well. We had some scares when the clear morning skies went into big puffy cumulus clouds, as others on Aruba also experienced, and so an hour before totality we got worried. But the sky began to clear, just as the prior three weeks of info on the U of MN site said it usually does there in Feb: cloudy mid mornings and burned off by mid afternoons on most days, and all clear most others, only one day a week really cloudy at most. The very brief showers the cumulus spawned, while nerve-racking, did help clear the air further, so it was not as whitish with dust and sand as had been predicted. We thought this was a surprisingly dark eclipse, at least it seemed so when we tried to operate our equipment. Most of the brightness seemed to be concentrated on the innermost corona, although the equatorial streamers were certainly visible and traceable for many diameters. The corona reminded us strongly of the one from 1973, rather a minimum type in transition with increasing activity, so the streamers had some fine length to them, but the poles were just the most delicate of brushes, and not many prominences were seen. These polar plumes were about as they show up on the enclosed jpeg, not nearly as bright as most photos make them nor the new formula compositing method in the January Sky & Telescope will make them appear. The sky indeed looked blue behind the corona, neither grey nor white, and it continued out into deeper blue, not into black, as again the new comp method generates. I timed the video tape to be at least 3 m and 13 seconds of complete totality, perhaps a few more seconds than that, if you're less cynical... About what you must have predicted for someplace several miles down from Oranjestad. The coronal "tone" was a pearly color, a tad of green-grey and cyan blue subtlety tinting portions of it (I really looked for such details this time!) 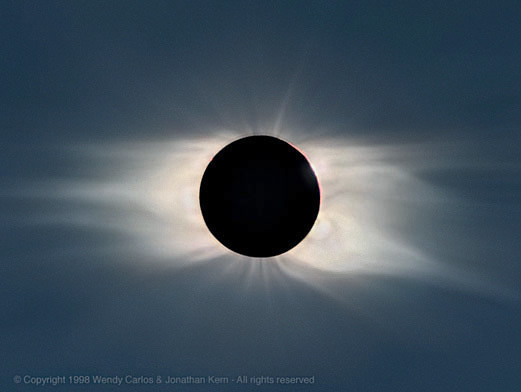 You could pick out the sky color in the places where the corona was dark or missing, and that tone was neither blackish, nor reddish, as most rad-grad images show it, nor grey, as some composites make it, in any way. It was fascinating to compare what I've seen of images only in the last few years, including those in the S&T article, with this, the real thing. Sharpened my awareness of the subtleties, and as they say: art is in the details. Alas, we had a camera snafu with our big cameras (don't ask!) and so got only our BU images, 35 mm and video. We would have caught it if we had been using the eclipse equipment more recently, or had had the time to practice beforehand. Thanks to the film score deadlines I'm working on now, there was no time for any such niceties, just the overnight "micro-adventure" and back! Shame, as we did so well running the cameras, they were rigid stable, the exposures all were as planned. Oh well, at least we SAW it and saw it well (Jupiter and Mercury were a neat bonus this show, didn't you think?) and got some decent medium res images to work from. Later a few friends emailed us a couple of additional jpegs, and so I made a hasty composite with what we had. Had to carefully hand retouch pieces of it, carefully traced from the decent Hi-8 video, in which I changed shutter up and down, to show all the corona, if only one tiny annulus of exposure of it at a time... But I'm getting rather faster at this, after the experience with your good images two years ago, especially, and I didn't spend all that much time on this -- perhaps two long evenings in all. I also merged in the grey-yellow-greenish earthshine glimpse of the lunar surface, gotten from an eight second exposure, as it shows up in long exposures when the sky is as clear as we had. It's a neat new look (perhaps a "first" in an all-in-one composite? ), and shows that this is indeed the moon in front of the sun (sorry, Virginia, no sun-eating monsters out there!) If our eyes had a wider dynamic range, this is what we would see. In binocs especially you can make out a bit of the lunar mares, as you know, but this is an enhanced view, of course. I've know him off and on for nearly 30 years, when Jon won an astronomy award at Stellafane for the impressive home-bulit apparatus he used for coronal imaging of the 1972 eclipse. He really knows what he's doing, and has worked recently fabricating and operating specialized equipment for Jay Pasachoff's frequent expeditions (see below.) This time he used a much improved custom made radial gradient filter, and a 1500 mm long refractor fed by a heliostat onto 120 (6x7) film. It was interesting to work with his originals, which had the opposite problem of compositing the usual coronal images, in that the darkest parts were near the limb, and had to be lightened. There was a nasty red-orange cast due to the chrome of the filter that took a lot of effort to cancel out without harm. But the results are very much better than I'd originally anticipated, and catch what the eye sees perhaps actually better than life (this may be the best single image of this eclipse -- at least thus far it appears to be.) I rotated true north to the exact top, while my original turned out slightly CCW of true north, thus the angular differences between them." 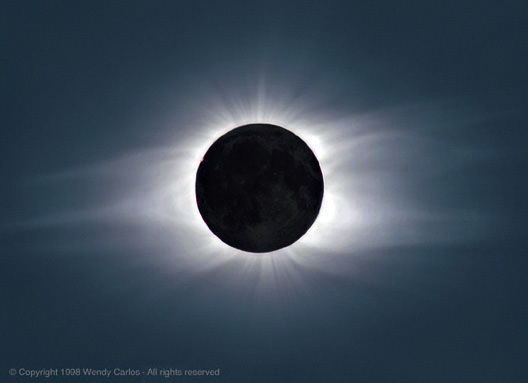 We're both very pleased by the results of this collaborative image, and it's garnered quite a lot of attention and compliments during the following year, from professional solar astronomers and knowledgeable amateurs, both. Thank you all! Note: A special thanks to Fred Espenak, for the original html-ing and posting of the materials in this page early in 1998, when I was unable to while working non-stop on a film score. Fred, you're the best! Jay has always taken a very large, ambitious battery of equipment to his Williams College eclipse expeditions, and he travels with many student-assistants, operating a lot of serious experiments and data-gathering (some later appear in his good texts on astronomy.) Included is always at least one medium tele lens 35 mm camera, usually a 500 mm one, for general views. The 1998 totality was no exception. He had both a 500 mm tele taking images on slide film (oops...) and a 600 mm on negative (good). All off them came out well, although in the scurry of other experiments, he didn't get any shorter exposures this time. He'd cordially asked me before to try working with him, at least compositing some of his shots, using the many approaches documented on this site more or less. This time I didn't want to refuse him, and since I'd not gotten any good images from my main cameras from technical foul-ups, it was a generous offer, and I hoped to learn more doing it (he also "bribed me" with his newest two books, and a Hi-8 video of the eclipse... thanx, Jay!) It took nearly 10 months to get to the actual work of it, due to the unusually difficult year after the eclipse. But starting last December, I got out all the Photo-CDs I'd had made from his best negatives and slides we selected earlier, and started in. But as you can see, it was possible to make a very "pretty picture" which was completely faithful to the originals. 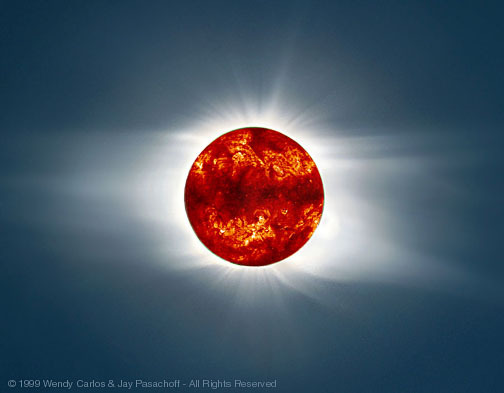 Later, Jay got permission to use the SOHO satellite Extreme Ultraviolet images of that day to combine with the corona. I did the work again, carefully filling in the usual "gaps" of SOHO images (this one is the Fe XII/Fe IX, X ratio image at 15:46 UT, 2/26/1998) in the data with reference to the other images taken near the same time, then scaled and rotated and composited the sun's surface view into the lunar disk. This is what you'd see if the moon were instead a special UV filter and re-channelizer, and allowed you to see the sun's surface atmosphere, or chromosphere, along with the outer one, the corona, at the same time. It makes a neat view, and since I'm rather proud of what came out of the assortment of varied originals, thought you might be, too. By the way, it's instructive to compare this image with the one right above, from Jon Kern's negatives. He used a textbook-style radial-gradient filter on his negs, Jay did not. So the brightest part of coronal detail, those nearest the lunar limb, are beautifully captured on Jon's collaboration, but the wispier stuff that make up the polar brushes at the top and bottom are weak or missing. On Jay's collaboration, nearly the opposite can be said. The wispy, dimmer details are more like what the eye saw here, while the extremely bright details and features are not well shown. Somewhere in between the two an ideal perhaps exists. Interesting, no? A final word, and pardon if it comes across as a semi-lecture: this image, perhaps more than any other, demonstrates the fact that no formula systematized series of steps can replace a human being who is intelligent, trained and flexible. I would be at a complete loss to try to give you a "method of composing symphonies and electronic soundscapes" for the same reason. A few of you have asked me for the techniques I use in preparing these images. The truth is that you could watch the process directly, just like you might watch a composer write a new work of music, and go away thinking it was a hodgepodge of stuff, each time different, improvisational, mysteriously directed, with nary an equation or algorithm in sight. And you'd be quite right, *sigh*. Eventually I'll find the letter containing "steps" I patiently listed for Fred Espenak (who is mentioned warmly above) in a long e-mail reply to him in January of 1998. There's nothing cute I'm hiding here, any more than in my music (kids often ask me for a music-making "equipment secret" for some album or another, and then gape at me when I plainly reveal that the the way I made this or that was just by working quite a while at it, doing it over and over until I got it right -- are schools misleading children into seeking some ritualistic "tricks" instead of learning the facts and skills they will need in life?) Hey, the secret words in both instances are obvious: "work, time, talent." And realize that not everyone can do everything equally well, but it's still worth trying, just like in the Olympics. Surprised? Shouldn't be. Fred was kinda annoyed, I think, that so many of my "methods" were heuristic, specific goal-oriented, requiring a lot of practice with a Wacom type pressure tablet, and made about as much sense as describing how to play the piano in 500 words or less... ;-) My best advice to any of you who wish to try eclipse imaging is this: Don't depend on any formula or rigid "method". Mediocre, ordinary results lie on that path. Learn Photoshop (or the equivalent) to a fare thee well. Practice with your Wacom stylus, blending and dodging and burning bits of adjoining or overlapping images, just like you do in a darkroom. Read a lot about the older darkroom and newer digital image manipulation methods, color theory and balance, making and using masks, retouching, and drawing from life. Be patient. At least some of you will be able to outdo my attempts here handily, with repetition and diligence. You'll gather skills you can use for image work of many kinds, and you'll have a lot of creative fun in the process! And for "the rest of you" (whomever I've not conned into doing this by my sermonette,) as I've heard in the world of music: who says an audience serves no active function? We NEED you, too. Honest.